Sections of the Mac-buying public have demanded a tablet-format Mac for years, but Apple has never delivered. Back at Macworld 2007, Axiotron announced the Modbook, a tablet computer built from a MacBook. And this summer, they released a new, improved version and announced an exclusive deal with Computer Warehouse giving the device its first official UK release. 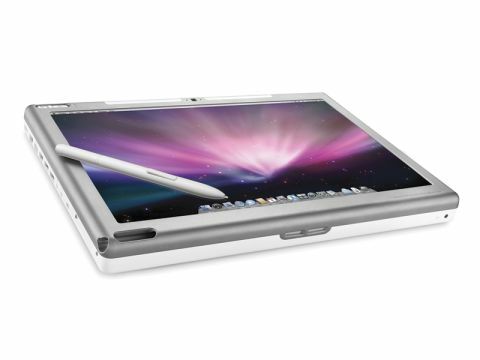 But is it the tablet Mac we've been waiting for, or does it vindicate Apple's decision not to release an official one? The Modbook we review here is based on a standard 2GHz MacBook, though a version built from a MacBook Pro is on the way later this year. The 2009 model enjoys several improvements over previous Modbooks. It's lighter, making it more comfortable in the hand when drawing, and offers an improved battery life. Bluetooth connectivity has been improved and the GPS has been given an overhaul. Modbook is aimed at computer artists, and comes with Autodesk SketchBook Express 2009, an art package 'designed for pen-based interaction.' It works nicely with Photoshop and CorelDraw too. When drawing quickly there's a slight lag, but nothing too disastrous. Likewise, the pen can be a little erratic near the edges of the screen, but it's easy enough to work around this. As an all-round computer it's less capable. Handwriting recognition is a slight chore, and typing using the virtual keyboard is a complete pain. Modbook might supplement your main Mac well, but it won't replace it. The Modbook is fine for artists, but a tablet Mac could do so much more. Until we get an official Apple device, with an iPhone-like multi-touch screen and a dedicated Tablet Edition of OSX, the true tablet Mac will remain outside our reach.